Acra Plant V-shot kit for Kinze 4000 (4900 row units) series planters. Does NOT fit Kinze 3000. Acra Plant V-shot kit for John Deere XP and XP Pro row units, MaxEmerge® 5 units. Acra Plant V-shot kit for John Deere 7200 MaxEmerge®2 and MaxEmerge® Plus. Acra Plant V-shot kit for John Deere EARLY (PRIOR to 1984) 7000 MaxEmerge®.Also Kinze 2000. 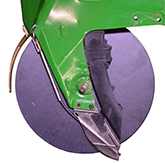 Acra Plant V-shot kit for John Deere LATER (1984, 85, and early 1986) 7000 MaxEmerge®. Acra Plant V-shot kit for White 9000 series planters. Acra Plant V-shot kit for Kinze 3000 Evolution planters.